On this update I had to add Croatian first division to find him, they wanted £25 million! Whilst I wait for FMT to be updated, anyone started a new save yet? He's not even in my game anymore! Guess I have to load the croatian league now then... That's kinda annoying. Got 38M transfer fee as a result. 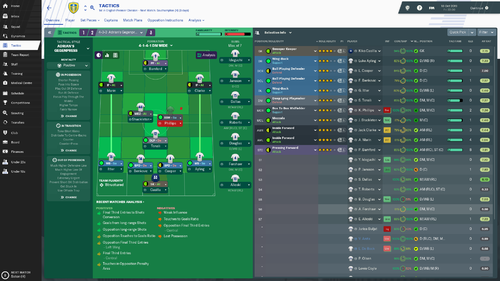 I then proceeded to buy some wonderkids llike Tonali 16m, Itter 7.25m and Benkovic 15.75m to strengthen my defence. I was really worried about premier league as my team were still too thin. but to my surprise I'm now at the top of the league after beating Man Utd 3-1, Newcastle 9-1 and drawing chelsea away. Lost 3-0 to Liverpool in the caraobao cup on purpose with fringe players so that i can concentrate on Premier league alone. Would definitely consider myself a title contender now, i hope so . Clarke has been immense for me as a right winger. Kalvin Philips is my first choice BBM. Ayling still proves hes one of the best players in Leeds. Wanted to get De ligt but he was way too expensive. Benkovic is a rock solid defender tho. 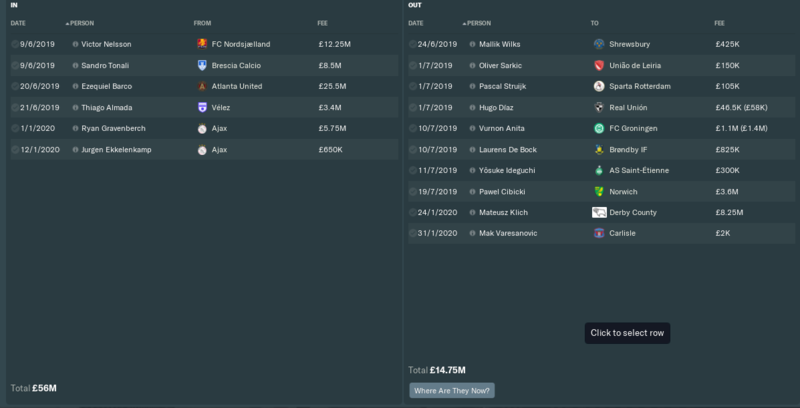 My wage budget is really starving. Really need the board to give me more funds in Jan else Leeds will die. Hi, guys. How are u? I'm from Brazil but I love this club. Leeds is my favorite team in the world (excepct my brazilian team, Cruzeiro). I've started a save, but I have some questions about how you start you personal reputation in game? I say that cause if I try sell anyone of influencer players, the all squad i'll be mad with me and I will lost the locker room. Btw, I need to sell some expensive players to get a some wonderkids, like Marin. So, after all, I will share my results here. Ty!! So, for realism I use just as semi professional player(I used to be) with no manager license. Started my save recently. My first season was not as easy as most of you guys at all. Won championship with 96 points only one point ahead of West Brom. I also imposed myself not to buy or sell anyone for the first season. 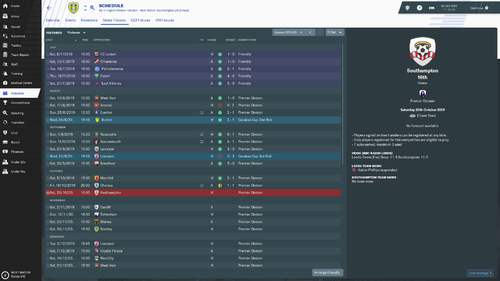 Also sold a bunch of people, got £42,5m and some good cash off the wage bill. I can easily see this season will be VERY hard. Do you guys know some staff to get? I mainly wanted 4+ stars coaches. Any recommentadion would be nice! ps: sorry for my crap english, I'm brazilian too. I just got the game and started up my first file as Leeds (as is tradition). Do you guys find the ratings of some players to be a fair bit underwhelming? Klich 3 star, best position as a deep-lying playmaker? Alioski unfamiliar with playing LB despite playing there for years? Same with Berardi at CB? And the rankings of some of the younger guys is a bit off too, particularly Mateusz Bogusz. We've signed him with big potential and he's been instantly great for the u23's. Yet his max potential in this is like 2 and a half stars? Also, no Nohan Kenneh, who is the star of the u18s, played his first game at 14, in all the England squads etc. Klich 3 star, best position as a deep-lying playmaker? Alioski unfamiliar with playing LB despite playing there for years? Same with Berardi at CB? Klich's a funny one. He's gone from awful to excellent very quickly, we have to be careful not to overreact to either. What would you change about him? Alioski has only played DL for Leeds recently, he has played WBL for Macedonia. Although I believe he is Competent > Accomplished rather than Unfamiliar here. And the rankings of some of the younger guys is a bit off too, particularly Mateusz Bogusz. We've signed him with big potential and he's been instantly great for the u23's. Yet his max potential in this is like 2 and a half stars? Unfortunately I have not rated Bogusz so cannot comment. He will have been rated by his previous club's researcher. Also, no Nohan Kenneh, who is the star of the u18s, played his first game at 14, in all the England squads etc. He is too young to appear in game at the moment unfortunately. Cut-off his 16 as of September 1st of the year of release. As a note I would also not take the star ratings as objective fact. 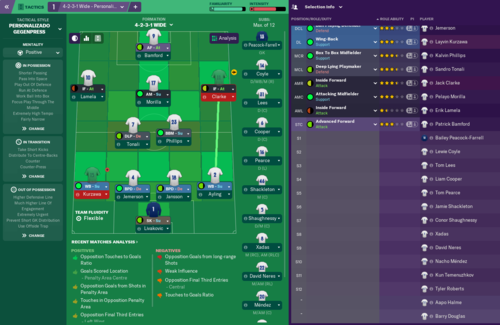 They are 1) only a staff member's opinion, which is fallible, 2) relative to your current team and depth in the position and 3) variable, for example Bogusz does not have a set potential but rather one that falls within a range, the exact number changing each time you start a new save. Alioski used to play LB for Lugano as well (and for most of his youth career I think) before being moved further forward, I'd say for sure he should be accomplished in that role. Ainda não mexi nos treinos, tava organizando os salários primeiro. Pode mandar print de como estão os seus? E o staff também, por favor. Você vendeu Roofe, Bamford e Alioske em alguma temporada ou ainda está com algum deles? I'm at the top of championship but I've lost my first game after 3 months and, as I know this game, a loss streak is coming. 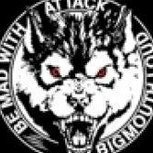 bwt, sorry about send a message in portuguese here. I apologize if I came off as a bit over the top in my last post. Appreciate you lots' efforts. For Klich, the main thing wrong is that all his best roles are as a playmaker, whereas in real life, he's all about off the ball movement. He doesn't take on a high volume of passes, doesn't really construct or manage play either. He's all about moving, opening spaces, quick combinations, sideline-to-sideline, box to box. He's been pretty great all season, but since about mid-January he's been incredible. He's the Leeds player this season with the most pre-assists, which is mostly down to his 1-2 touch combinations. Worth noting that he was generally well regarded in Holland too, at a higher level. As for Alioski, he only spent the last year of his time playing as a winger at Lugano.Was a fullback for years before that, and when he plays as a LW, he looks like a LB trying to play as a winger. He's a poor dribbler, poor in 1v1s especially, but he's a phenomenal athlete. His idols (in his own words) are Roberto Carlos and Marcelo, which is reflective of his primary position. Bogusz turned down offers (according to Phil Hay of the Yorkshire Evening Post, the main Leeds journalist) from Brighton and Napoli. Big reputation. Not a big deal about his ranking though. ^^^ Obviously a good deal of this is my own observations and I don't expect them to be taken as gospel. All the best. Também to no patch novo. Meus salários estão em £637k/semana. No começo da segunda temporada os salários sobem muito pelas clausulas e pelos jogadores que voltam de empréstimo, chegaram a £800k/semana aqui, então vendi bastante gente pra diminuir um pouco. Vendi o Bamford por £10m e o Alioski por £6,5m, os dois no começo da segunda temporada. 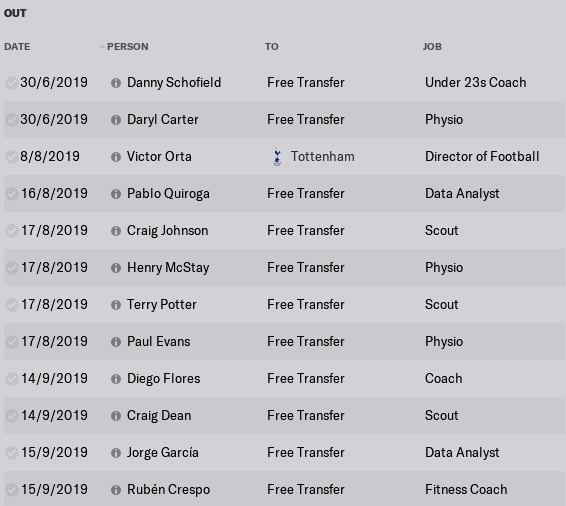 O Roofe ainda é meu atacante titular e o Tonalli não abaixam de £30m, mas aí peguei empréstimo com compra obrigatória por £15m. Boa sorte na Championship! Não sei se pode postar em português aqui, mas continua relatando! Ty man! My english isn't very well, but let's do it. I need to adjust my training and staff. I'm 2nd place in championship. The championship top scorers are Bamford, Alioski and Roofe. I hope sell 2 of them to make cash and reinforce my team for premier. I've alcanced a quarter final in cup but I loose front Tottenham. ps: srry for the last post in portuguese, I couldn't hide it. I won the championship. For second season, that is my transfer history and my team base. 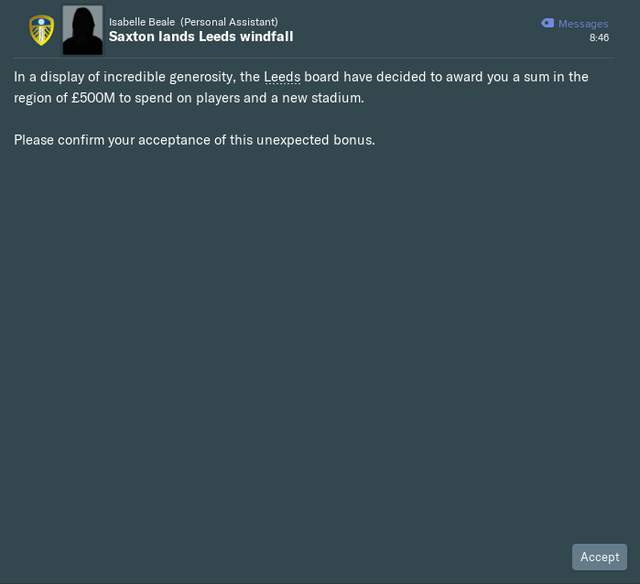 I'll trust in Bamford for now, I hope that he doesn't disappoint me. 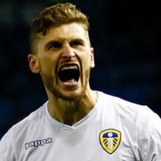 Klich to Gala? Ugh. No. I needed the money to get best player. So I've started my final save, no mass clear-out. 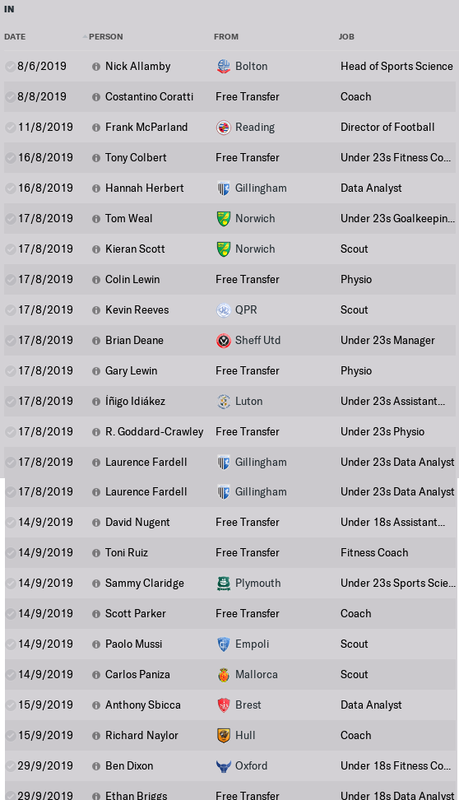 I have just sold Roofe though, which I'm instantly regretting but it was basically a choice between selling him for £8.5m now or missing out on Morilla at his bargain release clause price. Signed Tonali for £6m mostly spread over installments as he's that good it's impossible to turn down signing him. Worried about my lack of firepower, I've got Roberts and Bamford for my sole striker role, hope they can carry me through to January. Starting my 22/23 season. 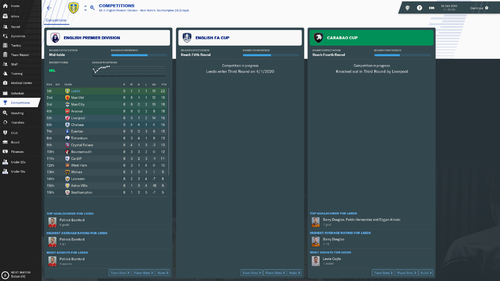 Got a 11th place, 4th place and 2nd place for the league so far and last season we won the Champions League! The league is sooo hard, but I really want to win it soon! I don't really expect to win the UCL soon again, but hope to do well again. Anyone ever come across anything like this? I'm back to the game! I finished my second season in 10th place in Premier. In third season, my team is unbelievable. I'm 4th in premier and Carabao Cup finalist (vs Tottenham). I won the Carabao Cup! But my team was so bad in premier after that so I finished at 8th. I start this season with only two changes in first 11. Livarola on LD and Shackleton replaced by Tielemans.